This is a listing for 7 SETS of a pearl bracelet and a pair of pearl studs. Each set will be wrapped in one personalized gift gox. You can have ANY text on the note card (but the note can not be too long)! This beautiful stretch pearl bracelet is made of 6mm off white Swarovski pearls. 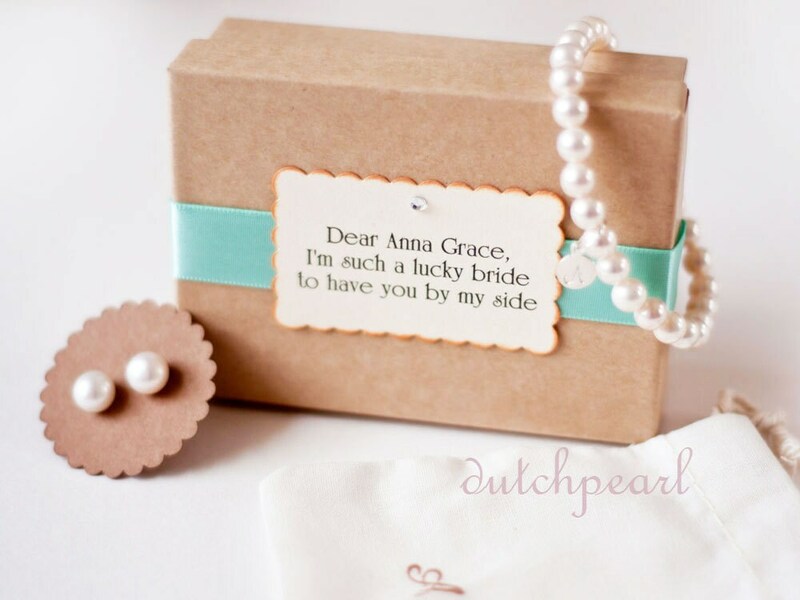 The stunning pearl studs are genuine freshwater pearls of 7mm. The pearls are strung on elastic cord, so the bracelet is easy to put on and off. The TINY (see picture compared to a dime) and delicate sterling silver charm is 8mm, including the loop. The letter stamp is left clean and not oxidized. The pearl set comes in ONE gift box, with a personalized scalloped gift tag in ivory. The gift tag has scalloped edges with an antiqued look. Every gift tag is made by myself and a little rhinestone is handplaced in the middle. The bracelet comes in standard medium size (7 inch), unless otherwise mentioned at 'message to seller' at the checkout. The set comes in a natural gift box with a satin ribbon of your choice. You can have ANY text on the note card! The note card (where your text is on) comes in ivory. The bracelet comes in a cute muslin bag,tucked in the gift box.